With just 16 to 17 hours ago, Apple has released the iOS 7 to iOS users publicly. Now we are seeing a heavy amount of web-traffic coming from iOS 7 running devices around the Internet. 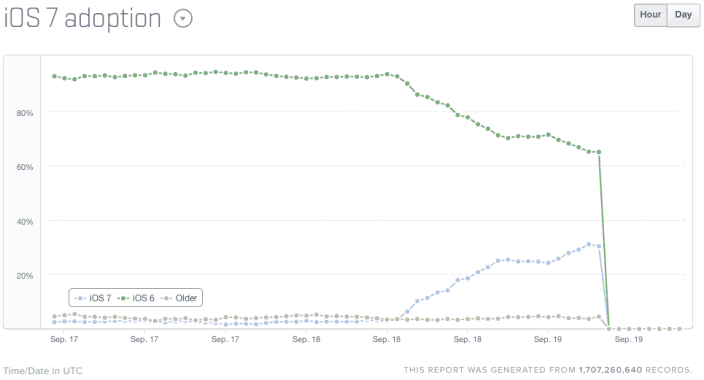 Webmasters around the world are now seeing iOS 7 in their charts rapidly increasing. There are no doubts that Apple has killed the fragmentation in its iOS devices with quick availability of iOS version for everyone. But there is a point when iOS 7 reaches more than 30% of iOS devices in just first 16 hours of launch in public. There are no doubts that I am bad with numbers, or you can say me a bit lazy. However, my quick assumption takes me to believe that more than 200 Million iOS devices are now running iOS 7 in just first 16 hours. Around the globe, we have heard that many institutions run out of their bandwidths after the launch of iOS 7. Majority of iOS users community start downloading the iOS 7 final version on their devices to get all the latest features. Through out the day we have seen a huge hammering on Apple Download Servers, and iOS Activation Servers. Almost every other thing gets disturbed with huge demand of downloading an iOS 7 on iPhone/ iPad / iPod Touch device. In our own website, we have seen 40% of iOS users have already updated their devices to iOS 7, and the rest people are yet to join the pool. What do you think about the success of iOS 7? Are you downloading iOS 7? Hamza is a geek with love towards iOS and Jailbreak. He is the founder of GeekSays, and many other iOS blogs. He is the most viewed writer at Quora.